Were it not for the fact we had a word association with a well-known decongestant body rub going on, we’d probably have forgotten Vaporum’s name by the time we’d done typing this sentence. It gives no clue whatsoever to the game in hand, it being a steampunk dungeon crawler that brings to mind titles like Eye of the Beholder or Ultima Underworld. Only unlike those ancient PC games the camera isn’t freeform, your view being restricted to the four faces of a cube. Effectively north, south, east and west. You’ll immediately notice how dark the default view is and after checking the brightness on your telly, you’re likely to alter the gamma settings so you can actually see where you’re going, just as we did. Getting the obvious Bioshock comparisons out of the way, your character also has convenient amnesia and the setting is a labyrinth of initially unknown origin. 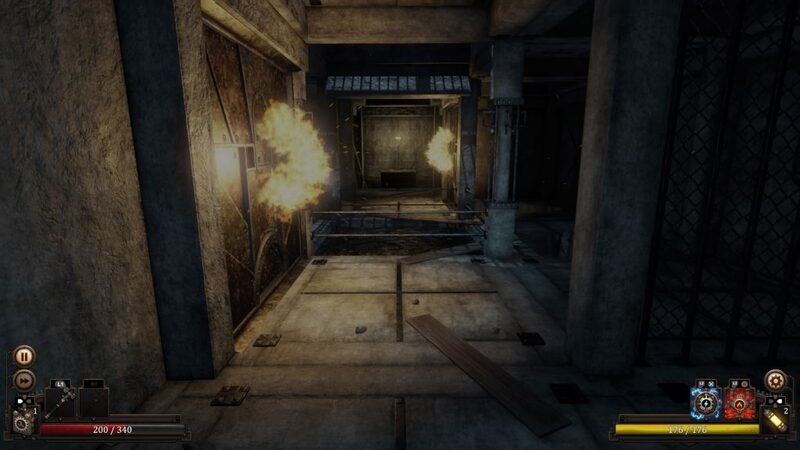 The setting can’t help but bring to mind Irrational’s 2007 odyssey, dank corridors filled with secrets and enemies out to get you. That game casts a long shadow, but it’s not a bad one to draw comparison with. Vaporum doesn’t stray too far from familiar RPG trappings either. Especially in terms of managing your inventory and gadgets that you’ll unlock as you progress. It was amusing to unlock a trophy for filling our inventory with junk, most of it being generally useless as weapon durability doesn’t need to be factored in here. Your path further through the labyrinth is initially halted by environmental hazards that you can’t progress past until you equip one of four exoskeleton rigs, each with slightly different stats at the outset. We found ourselves choosing an all-rounder that didn’t focus outright on a particular stat. Though bear in mind you’re stuck with this choice at the outset. Eventually you’ll discover the initially lifeless labyrinth isn’t so dormant after all, with robot sentries of varying threat wanting to cleave your skull asunder. There’s a palpable threat with each encounter, with flashes of red indicating the direction you’re taking damage from. This is useful when you’re facing multiple enemies at once. You’ll eventually end up facing humanoid enemies the further you progress. One enemy encounter had us facing a sentry that attacked us as well as using an electrical attack that had us on the ropes afterwards. We’d not noticed it before but with each successive enemy defeat we’d filled an experience bar that was close to full after almost being zapped to oblivion. In a smart introduction, the devs let you gain access to the same power by using a gadget dropped by the drone in question. We spent a good while hunting around for energy boosts to replenish our depleted health gauge until we realised the enemies we’d heard scuttling around were behind a barrier and couldn’t get to us. Cue one zap, two enemies smited and we levelled up our exosuit along with replenishing our health bar into the bargain. A clever piece of design and a great feeling of empowerment. Subsequent thaumatolurgical gadgets (in Vaporum‘s parlance cribbed from AD&D) include flamethrowers and acid. Functionally similar to plasmids in some regard, once again proving similar to Bioshock. The plot is fleshed out in fairly typical fashion by audio logs and notes you’ll discover in lockers and chests throughout the facility. As is the norm, they tell the story of day to day activities slowly unravelling as the looming threat makes itself known. It’s a well-used mechanic, but well done with it. Naturally there’s a trophy for discovering all these incidental notes, many of which are stashed in hidden areas that take you off the beaten track. A useful mechanic rears its head fairly early on. You can freeze time by holding L2 and tapping up on the dpad. This comes in somewhat useful when you face enemies as it lets you get your act together in terms of choosing the correct weapon and elemental power to retaliate with before they’re on you. Later on, you’ll come upon timed switches that enforce use of this power, literally only remaining open for you to face in one direction and move between two switches and out of the door before time expires. For this reviewer at least, it brought to mind the Alan Partridge Train Toilet Drill in terms of co-ordination. 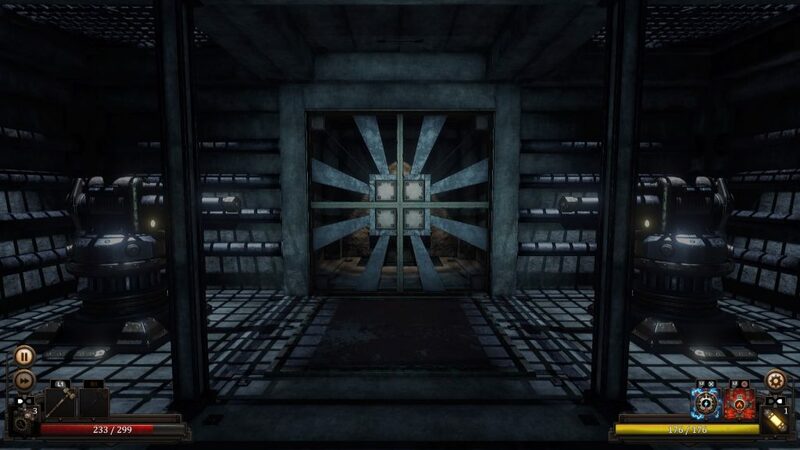 Each series of rooms within a level are effectively a series of puzzles strung together, gated off by different one use keys and environmental hazards. From the second level onwards you’ll come upon turrets that you’d do well to destroy lest they reciprocate. The first time you encounter them, it’ll just be the one to deal with. 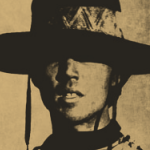 The second time you meet them, you can make like Doug Quaid in the Pyramid Mines and decoy a pair into shooting each other. Over the remaining ten levels you’ll find your way to the top of the tower and unravel the ensuing mystery of its purpose and how you found yourself at it’s foot. It’s a story well worth persevering with, put it that way. We’ve mentioned a few of the trophies already, though we don’t expect to be getting a platinum without having multiple attempts. 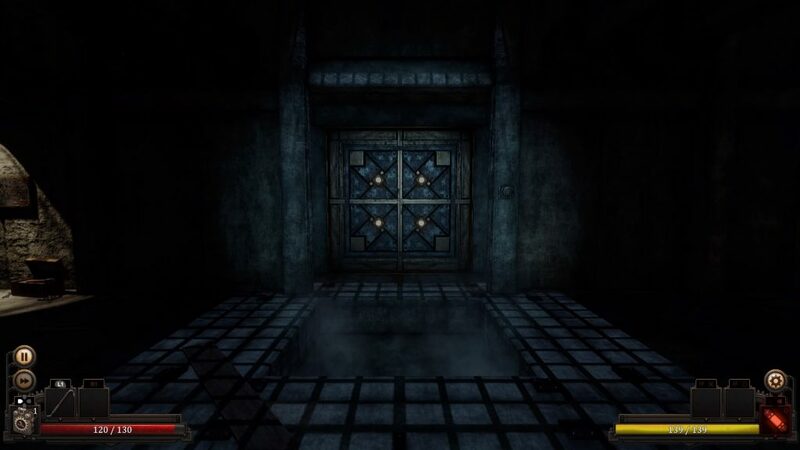 There’s one for a speed run in under ninety minutes, we expect that along with the one for finishing Vaporum on the highest difficulty would prove the biggest stumbling block. If there’s any criticism we have, it would have to be the save system. It doesn’t really know what it wants to be. We replayed several sequences repeatedly due to getting caught up in the moment, only to die and be bumped back to an earlier save we’d made. Vaporum autosaves when you change floors, so why not more frequently otherwise? 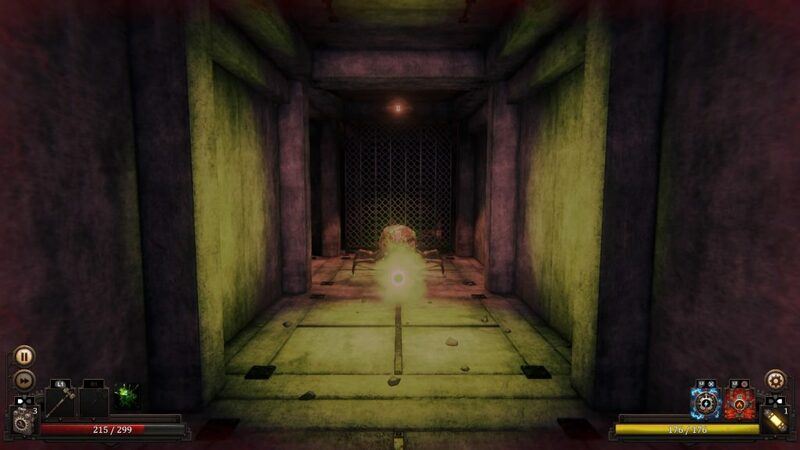 Say for example when you’ve opened a door with a key or unlocked one of the many secret areas. 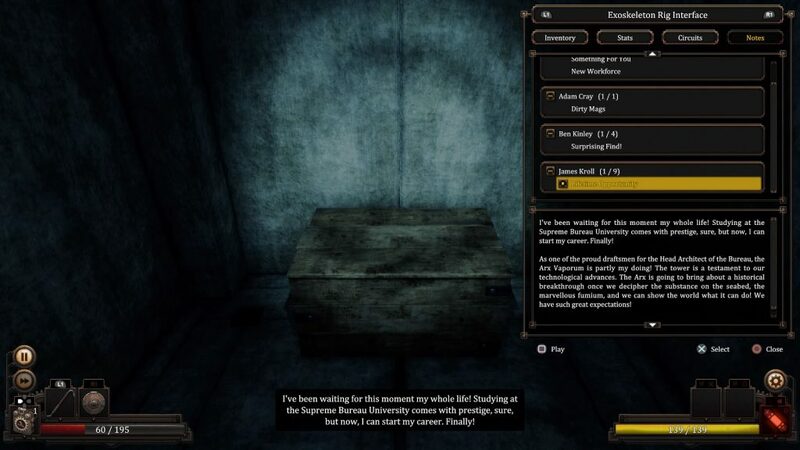 In addition, the UI betrays Vaporum‘s PC origins with menus and text being a bit on the small side, even on a massive telly. In conclusion, Vaporum is an interesting steampunk themed dungeon crawler that will draw inevitable comparisons to Bioshock, but that’s no bad thing.